What a year its been for the sport of boxing this year when you stop and think about it for a minute. We had the resurgence of the heavyweight division and the formation of a three way rivalry between Tyson Fury, Anthony Joshua and Deontay Wilder that brought genuine excitement back to the sport’s traditional glamor division. We had more TV companies and streaming services than ever reinvest back into the sport and make pro boxing available to watch more widely than perhaps than ever before. Women’s boxing continued to grow in the pro ranks. Emerging talent broke through worldwide and from a pound for pound perspective, the likes of Vasyl Lomachenko, Canelo Alvarez, Terence Crawford, Mike Garcia and many others really made their stamp on the sport this year. 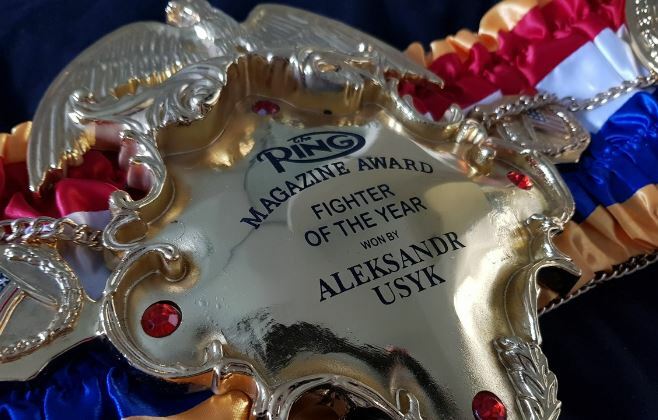 But out of all the fighters that lit up the boxing calendar this year perhaps none did it more impressively than the boxing phenom from the Ukraine – Oleksandr Usyk. A memorable capturing of the Muhammad Ali trophy to win the inaugural World Boxing Super Series which for the first time ever unify all four world title belts in the cruiserweight division was only topped by a stunning stoppage win on away soil against Tony Bellew to cap a remarkable year off. Well deserved. Some great fights to be made at heavyweight for him. You’d be hard press to argue with the above decision in fairness.